All transactions are safe and secure with a reliable history in online purchasing behind each of our associates. 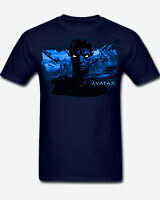 Buy the Glow-in-the-Dark Avatar t-shirt to own Avatar clothing and merchandise. If you are looking for something more dazzling, then we have you covered. While all of our Avatar t-shirts will get some looks, this glow-in-the-dark one will help light up the imagination. If you prefer Jake Sully (Sam Worthington) over Neytiri (Zoe Saldana), Dr. Augustine (Sigourney Weaver), Trudy (Michelle Rodriguez) and the other characters, then this glow-in-the-dark Avatar movie shirt is for you. Also, check out the collection of Avatar action figures, video games and more below. In addition to the Glow-in-the-Dark Avatar tee above, browse the Avatar Clothing Gallery for more apparel like men's and women's clothes, kids shirts or hoodies.